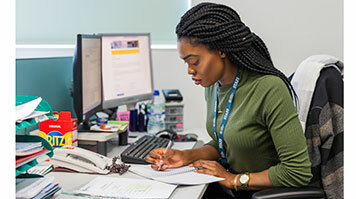 Working alongside our Student Support and Employment Team, the Student Engagement Interns are a group of recent graduates who are there is you’re having any issues that are stopping you from achieving your potential, or that might be preventing you from completing your studies. They work hard to improve the student experience which is why they were named the ‘Outstanding Student Services Team’ at the 2018 Times Higher Education Leadership & Management Awards (THELMAs). Muizzy Ibraimoh was one of the first graduates to become a Student Engagement Intern. We asked her to give you some insight into what the team do to support our students. “We’re the bridge between the students and student services within the University. We’re aware of all the services available in order to signpost students to the right service at the right time, this might be health and wellbeing related, financial advice, disability and dyslexia support, library and skills for learning and student employability. All these services have helped students who were on the verge of withdrawing from their studies. “It’s a role that gives you the opportunity to help make a change in people’s lives, and I’m happy and proud that I’m able to help our students through trying times and realise their potential. “Each day I check our internal systems to identify students who have fallen below the threshold for attendance and contact them, either via email or phone, to understand why they have not been attending university. Using the information I have available I can get a better understanding as to what the issue might be. For example, if you can see a student accessing the library at the same time they have a class, it could be because they are struggling in their classes. “On my first contact with a student I begin by explaining my role and ask why they’ve been missing classes and if there’s anything that we as a university can do to support them. Some students feel comfortable to discuss things on the phone and others feel better speaking in person, so I schedule a meeting with myself and any relevant people who I feel are needed based of what the student has told me (after consent from the students). “After the meeting, a plan of action is usually created to get the student back on track with their studies or interrupt their studies if that’s better. By interrupting studies students then have the option to return and pick up their studies when their life allows. "The role as an engagement intern is very hands on because we’re able to meet with students on a one-to-one basis and create a relationship with them through our various form of communication. "It’s great because I feel like I’m really helping make changes in students’ lives. "The best place to signpost students that are thinking of withdrawing or having any issues is the Student Life Centre, if possible they can also speak to their student engagement intern within their school." Current Students: If you are a current student you can contact our support team.